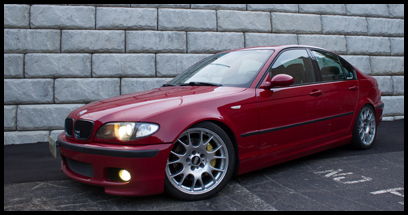 2005 BMW Imola red, beige interior, automatic with only 65K miles on engine / drivetrain with some front end damage. Driver stepped on gas instead of brake and bumped the wall of building, deploying both front air bags. Left front rail guard is damaged (passenger's side appears okay). Not covered by insurance so clean title but owner has taken it as a total loss and moved on to another vehicle. Looking to part out entire vehicle as most everything goes. Damage isolated to front of car (hood, grill, front bumper, bumper shocks and driver’s side rail damaged). Engine fully runs - can show buyer. All four fenders, doors, rear trunk in excellent condition. 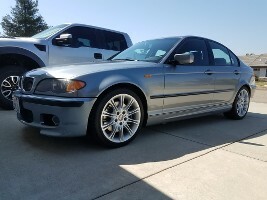 Most everything of interior in very good condition includes full leather seats with ZHP black cube accents. Car Options: Full performance package, full leather interior, moonroof, Xenon headlights, CD player. Car is located in Orange County, CA. Will consider shipping part requests ($100 or more) at this time. Otherwise, you can send me a PM and if stop by and pull your own parts. There are lots of parts to consider. Last edited by mgianzero; 01-08-2019 at 11:36 AM. Price on the black cube trim? how much for the headlight ignitors/ballast? Looking for the harmon cover speakers covers on the front doors. Last edited by Vas; 12-05-2018 at 02:28 PM. Looking for front exterior door pulls with caps and side mirror caps if clear coat is intact. Last edited by Mless5; 12-05-2018 at 02:01 PM. I'm looking for the rubber part that goes on the outside drivers side of the door above the window. I've sent you PM yesterday regarding pillars.